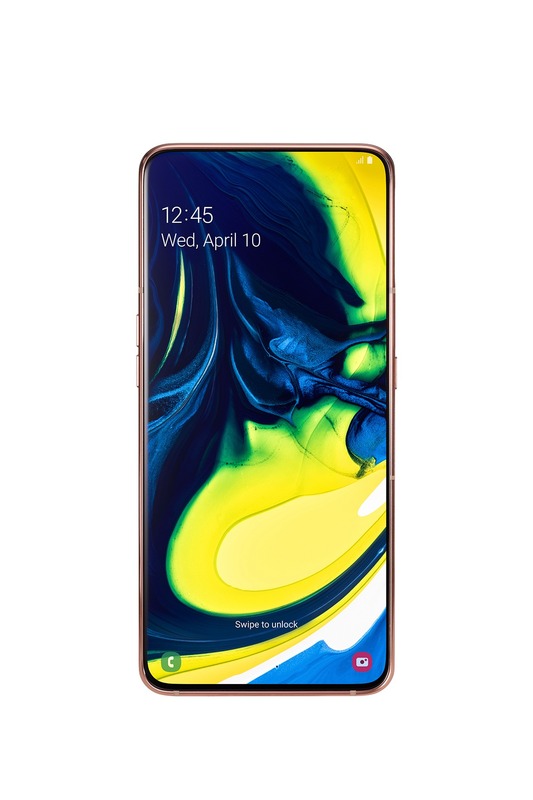 After a lot of leaks and rumors, the Samsung Galaxy A80 is now official, and it’s one of the unique looking phones that Samsung has launched in the past few years. 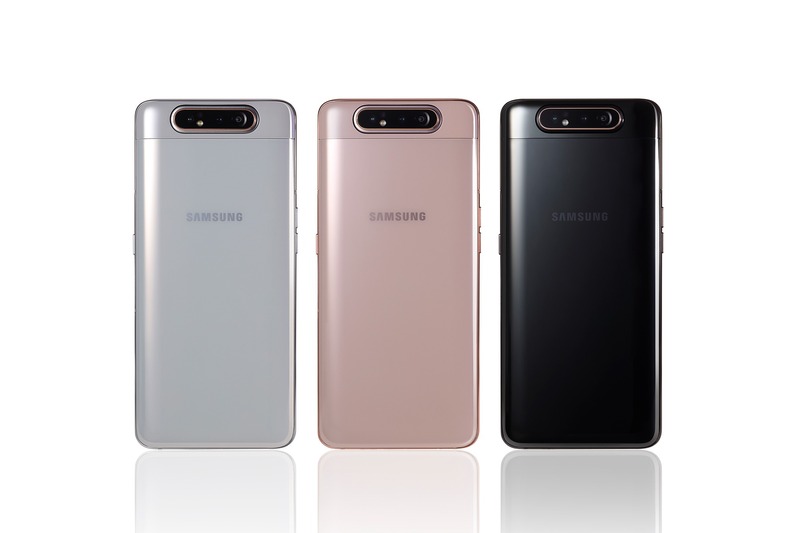 For the very first time, Samsung launched a phone with a pop-up camera mechanism, and in addition to that, there is a rotating mechanism as well that make it different from other phones with pop-up cameras. 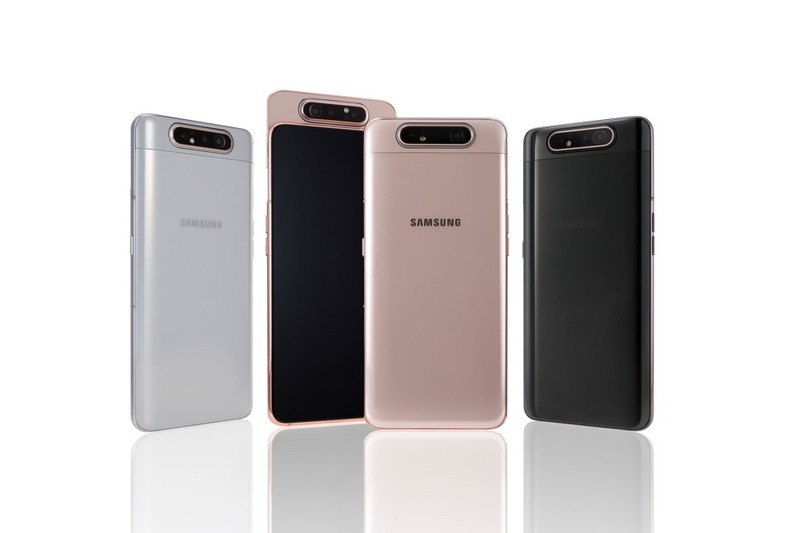 It was previously rumored to launch as Galaxy A90, but Samsung decided to launch it has the A80 instead. The Galaxy A80 is the first phone that has a Notchless Infinity display, something that even the Galaxy S10 series doesn’t have. So, there is a bezel-less display that doesn’t have any notch or cutout in it. As you can see in the render above, the bezels are almost negligible that give the A80 a gorgeous look from the front. It is a 6.7-inch Full-HD+ (1080×2400) Super AMOLED New Infinity Display. Moreover, the fingerprint scanner is also placed under the screen. So, where is the front camera? Well, there is a triple camera setup on the rear, and that’s it. There is no dedicated camera on the front. When needed, the three cameras automatically pop-up from the back of the phone and rotate to take selfies. So, you can consider it as a combination of the pop-up mechanism of Oppo Find X and the rotating mechanism on the Oppo N3. There are questions like how durable is this mechanism or what would happen if dirt gets into the mechanism. Talking about the camera specifications, there is a primary 48 Megapixel f/2.0 camera, a secondary 8MP f/2.2 123° ultra-wide-angle camera & a third 3D ToF sensor for better portrait shots & even portrait videos. Under the hood, there is an octa-core processor clocked at up to 2.2GHz. Now, Samsung didn’t reveal the name on the official newsroom, but as per the previous leaks, it is Qualcomm SM7150, i.e., either the Snapdragon 730 or 730G that were announced recently. There is 8GB RAM and 128GB internal storage and no option to expand the storage. The battery underneath is a 3,700mAh unit, and the phone supports 25W Fast charging as well. It is interesting that even the Galaxy S10 series doesn’t support 25W Fast charging. Android 9 Pie runs out of the box with One UI on top. Despite having a glass back, there is no Wireless charging support. The color options include Phantom Black, Angel Gold, and Ghost White. The Samsung Galaxy A80 is priced at €649 ($730) & will go on sale starting May 29th.